Golden Banner is one of the first wildflowers to make an appearance each year in Chautauqua Meadown just below the Flatirons. Spring snow is also common this time of year. A snowstorm dumped 6 inches of fresh snow on this patch of Golden Banner earlier in the week, pushing them down close to the ground. 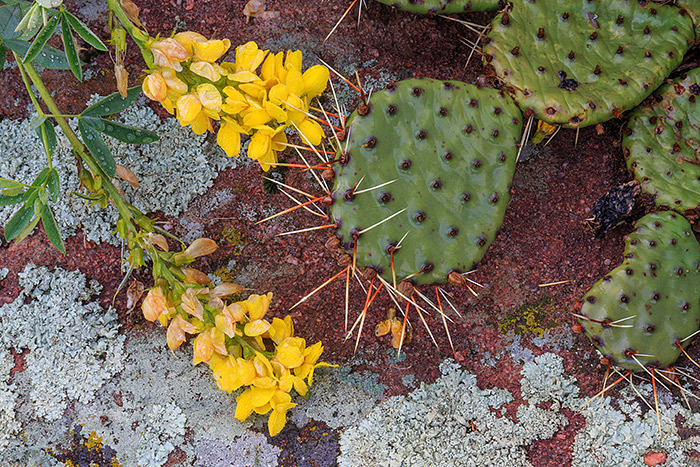 Now these Golden Banner rest almost on top of the Prickly Pear cactus growing on top of this lichen covered rock. Photo © copyright by Thomas Mangan.